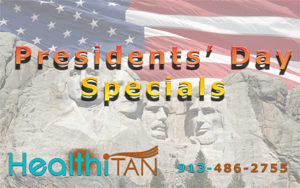 Check out our specials for Presidents day! Buy one and give 1 Tan FREE to any friend! The snow is melting Overland Park & Olathe! HealthiTan carries a line of tan maintenance products that Really work. Moorea Moisturizer & Bali Body Butter both made from pure African Shea Butter. Heals, soothes & hydrates by locking moisture into the skin thus it does not evaporate out of the skin from dry air. DHA is the active ingredient in all spray tan solutions. Even though ours has rich nutrients derived from organic botanicals, the DHA is naturally drying to the skin. Our Moorea Moisturizer has what exactly what your tan needs to ensure each one will last you 7-10 days. Get a bottle next time you are in. $25 & $6 sizes available. When you purchase our 16 oz bottle, when empty, return the bottle & we refill it for $2 less!